The first Super Safe Summer event in Asbury Park event is scheduled for Saturday, June 14 from 11 a.m. to 3 p.m. at the future site of the Springwood Avenue Park, between Union and Atkins avenues. The event will highlight all the summer programs available to the city’s youth. The event is free and open to the public. Attendees can expect three-legged races, sack races, an egg toss and other fun activities along with food, music and entertainment. Information will also be available about jobs, housing, health care, public safety and education. 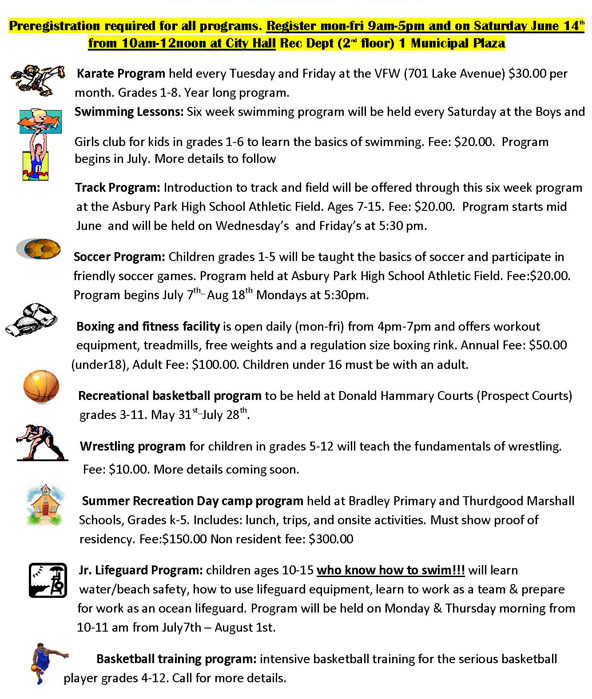 Representatives from the Asbury Park recreation department, area social service providers like Prevention First and the Mercy Center, and other groups will be on hand to explain their summer program offerings as well as year-round services available to city residents. The event is co-sponsored by the city’s Community Development Initiative and the Asbury Park Community Action Network [AP CAN], two of the city’s anti-violence initiatives. At the event, AP CAN will launch the “WE CAN” media campaign. An aerial photo of attendees arranged to spell out the phrase will be taken on the day of the event for future use on billboards and other media outlets.